Moto Guzzi marks the 50th anniversary of its V7 model family and its racing roots with the race-tastic, limited-run V7 III “Racer.” This third-generation model brings a distinct cafe’ racer vibe to the table along with modern comfort and performance for what the factory hopes is a bike that is “more pleasure to own and ride.” Did they succeed? Well, the jury is still out on that, but the 52-horsepower engine, fully-adjustable rear shocks and pillion pad hidden under the tail fairing certainly bode well for the Racer. 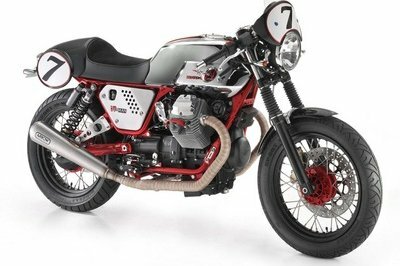 ’Guzzi boosted the power this year, and it also updated the visuals and slimmed the bodywork down for more appeal. Traction control provides some contact-patch protection, but that seems to be the fanciest gadget the Racer has to offer. 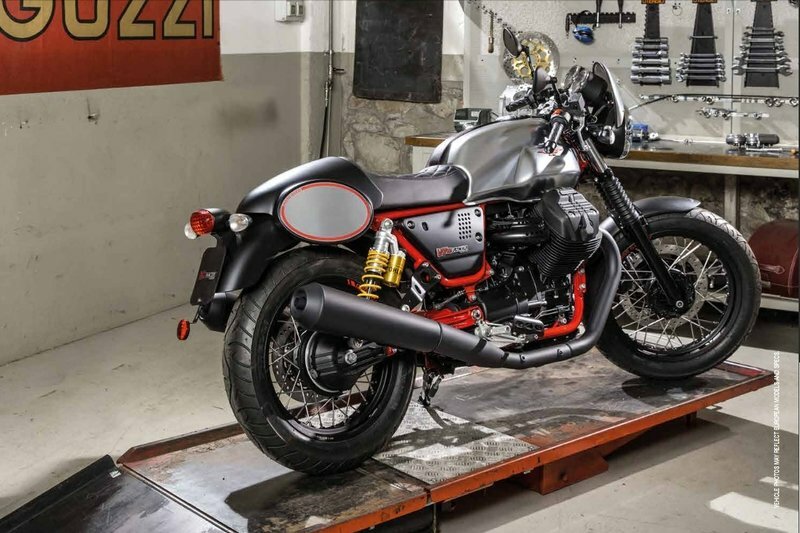 Join me while I dive in to ’Guzzi’s new tribute piece to see what makes it tick. 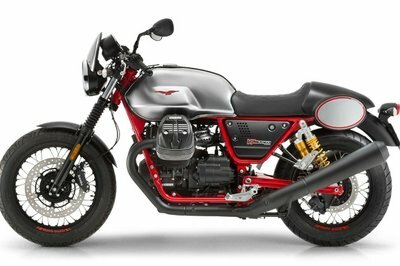 Continue reading for my review of the Moto Guzzi V7 III Racer. It's a classic cafe' that hits all the important points without going too far over the top. The factory built this bike to serve as the top-end of its entry-level cruiser range, and it comes laden with a generous portion of yummy-goodness with all the appropriate historical references on open display. Impossible to overlook, the Rosso Corsa palette on the frame is a direct reference to the first of the V7 Sport family that also sported a crimson cage to earn the ingeniously-clever moniker “red frame.” The bold rouge hue stands out nicely from the blackout engine, side covers, front fork sliders and exhaust system with a nice contrast against the Satin Finish Chromium tank and flyscreen. An old-school custom vibe sets in right off the bat with a cut-down front fender, blackout headlight can and bellows gaiters. The flyscreen is extremely brief, and though it does offer some protection for the instrumentation its main purpose is the visual connection to the cafe’ racers of old. 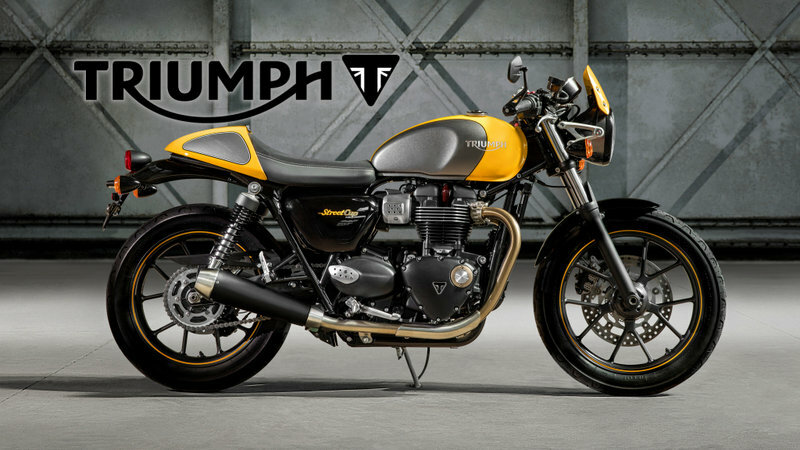 The tank sports a red, spread-winged eagle graphic on the odd looking bump that optically offsets some of the protrusion of the engine heads and forms a sort-of knee pocket similar to some of Triumph’s tanks. A brand-new saddle design comes with a quilted area and a steep rise to the pillion that cradles the pilot’s fifth point of contact, but the P-pad comes with a rather steep taper that speaks to a greater concern with looks/performance than passenger’s comfort. It also comes with a tail cover that comes complete with a racing-number plate on both sides. You would expect the shape of the slip-on fairing would suffice, but MG saw fit to make the actual seat that shape as well, and it’s certainly not confidence-inspiring for the passenger. Maybe this bike should come with an “If you can read this, the passenger fell off” T-shirt? Oh well, at least it looks cool. The blackout upswept exhaust makes another historical tie-in, though a pair of shotgun pipes would be okay too in my book. In back, a tidy little taillamp/turn-signal combination takes care of the lighting business and keeps the rear end clean and slim with a plateholder down below. All in all, a classic cafe’ that hits all the important points without going too far over the top. The engineers took advantage of the opportunity afforded by the frame rebuild to improve ride quality with tweaks across the entire Trinity: handling, cornering and stability. An all new frame uses tubular ALS-steel members to form the classic, dismountable double-downtube/double-cradle structure. The engineers took advantage of the opportunity afforded by the frame rebuild to improve ride quality with tweaks across the entire Trinity: handling, cornering and stability. Steering geometry indicates a definite flickability to the ride with a steering-head angle of 26.4 degrees and 4.17 inches of trail on a 57.5-inch wheelbase. Even the rider’s triangle is set to encourage an aggressive, forward-leaning posture with plenty of room to throw around some body English to take advantage of this newfound agility. Front suspension is rather vanilla with a set of standard 40 mm stems that offer nothing in the way of adjustability, but do provide 5.11 inches of travel at the axle, which is typical for this type of bike. Out back, a pair of fully-adjustable Öhlins shocks buoy the rear end so you can dial it right in for conditions and preference. A single 320 mm disc and four-pot Brembo caliper slows the 18-inch front wheel with a 260 mm disc and twin-piston anchor to slow the 17-inch rear. 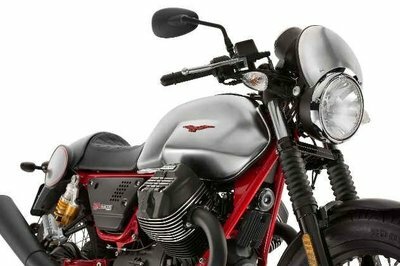 I’m a little surprised MG doesn’t offer ABS on this model, but I suppose it’s supposed to be a racy bike after all, and it’s definitely in ’Guzzi’s entry-level range so I’m sure the factory had to make some concessions to keep the final price down. The factory rebuilt the V7's transverse-mount V-Twin with an eye toward efficiency with improvements to ventilation and other engine systems. 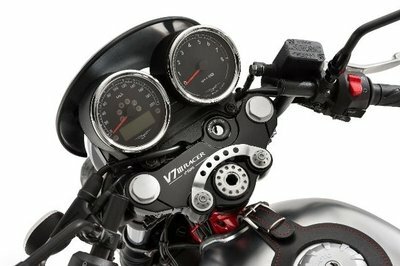 The factory rebuilt the V7’s transverse-mount, 90-degree V-twin with an eye toward efficiency, as evidenced by the measures it took within the revised aluminum case. Improvement in the ventilation reduced the pumping losses associated with the air’s resistance to getting shoved back and forth through the engine due to the reciprocating motion of the pistons. The oil pump also saw some tweaks to reduce the power it absorbs, and the addition of the piston-cooling jets that spray pressurized oil onto the bottom side of the piston crowns should help mitigate the heat and stabilize the pistons to help prevent galling and scoring. A marginally-oversquare layout with an 80 mm bore and 74 mm stroke gives it a 744 cc overall displacement with 44 pound-feet of torque that peaks out at 4,900 rpm. All that goodness is backed up by 52 horsepower that comes on fully at 6,200 rpm. This year sees new heads, cylinders and pistons with dual, pushrod-actuated valves in each head. Euro 4 emissions compliance was also a front-burner topic, and the factory achieved it through the double O2 sensor, catalytic converter and secondary air inlets in the heads. Checkout at the register is close to the $10G mark if you don't go nuts in the accessories catalog. U.S. buyers can expect to give up something around $9,990 for a V7 III Racer, and it comes only in the Satin Finish Chromium tank color with black fenders and red frame. 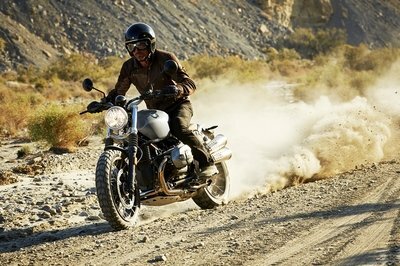 Naturally, ’Guzzi gives you plenty of opportunities to pad the price well beyond MSRP with an array of accessories, so peruse the catalog at your own risk. Harley kicks it a little deeper into cafe' territory with a mini bullet fairing that screams CR to go with the tapered, Mustang-style seat that is more passenger friendly, but a bit less cafe'-tastic than the saddle on the 'Guzzi. 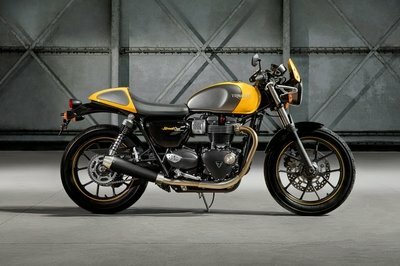 There’s only about a bajillion cafe’ racers, and I thought about going with Triumph’s Street Cup from the Bonneville family. 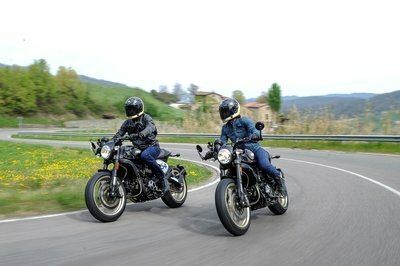 However, I’m mainly focused on the domestic market, and since I expect the Harley-Davidson Street 750 will be a more prevalent threat to ’Guzzi’s Racer over here, I figure it’s a much better match for my head-to-head. Harley kicks it a little deeper into cafe’ territory with a mini bullet fairing that screams CR to go with the tapered, Mustang-style seat that is more passenger friendly but a bit less cafe’-tastic than the saddle on the ’Guzzi. Lookswise, the Racer is more, well, racer-like complete with number plates and the whole bit while the H-D seems more streetwise and laid back at the same time. Both sport liberal amounts of blackout treatment with bellow gaiters to blot out what would normally be a bright bit up on the front forks. The Street runs a tubular-steel, double-cradle frame with an (unfortunate) radiator and shroud mounted to the downtubes. That’s not quite as clean as the air-cooled Racer, I gotta’ say, but at least the heads don’t stick out the sides. 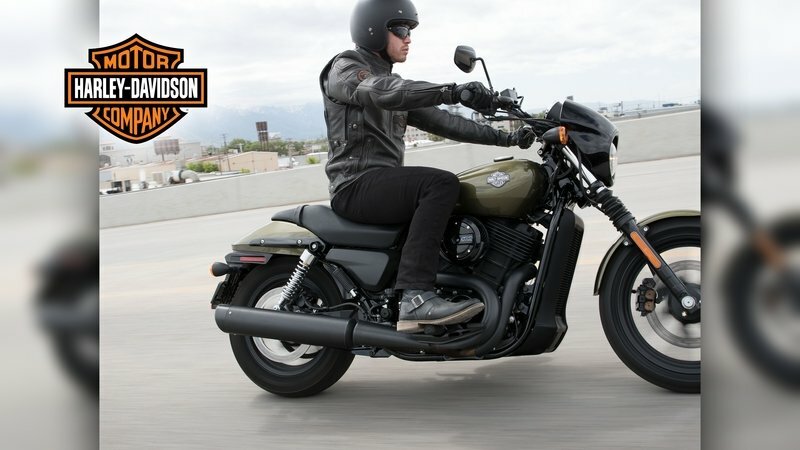 Harley’s 753 cc Revolution-X V-Twin powers the Street with 44.5 pound-feet of torque at 4,000 rpm, neck-and-neck with the ’Guzzi; but as usual, Harley’s engine control is pure vanilla while the Racer sports a traction-control system. Oh well, at least you can get ABS on the Street if you’re into that sort of thing. Harley gets a definite win at the checkout. Not only does the MoCo enjoy a good deal of brand recognition in the States, but they start at $7,599 for the Vivid Black model versus $9,990 for the MG. While that’s not a whole lot of cheddar in the grand scheme of things, the difference represents a significant percentage of the overall price, and that may be a dealbreaker for cash-strapped, first-time buyers. 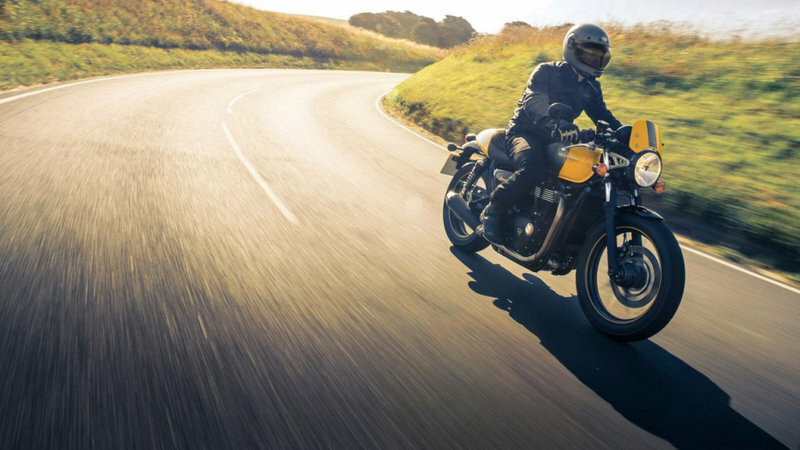 My wife and fellow motorcycle writer, Allyn Hinton, says, "This V7 III family saw some nice improvements last year and they’re very much contenders in this retro-revival movement to attract the new generation of buyers in the 18-to-28 age range. You can feel the changes in the performance. This is a much more snappy ride that it was previously. If you thought the V7’s were a bit grandma-ish performance-wise in the past, take a look at them again. I’m not sure more than a couple of exits up the interstate is wise, but for buzzing around town, it’s a fun ride." 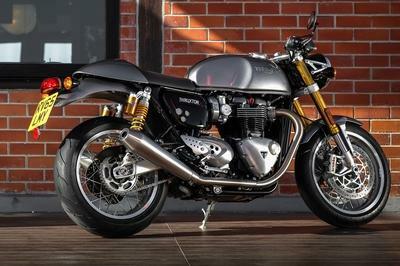 See our review of the Triumph Street Cup. 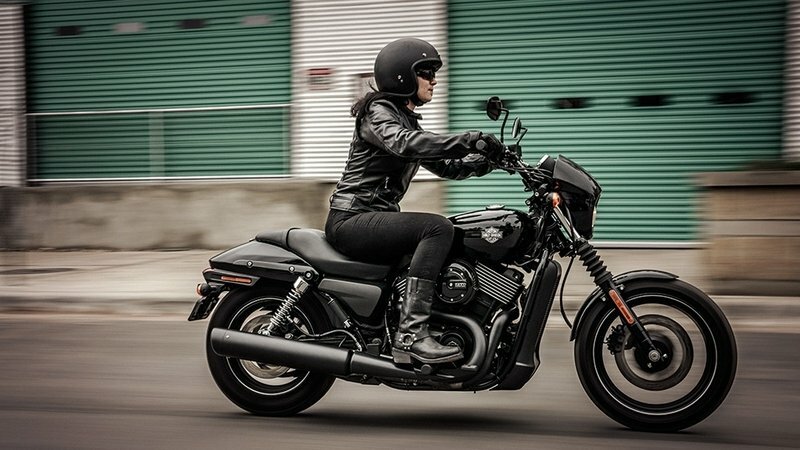 See our review of the Harley-Davidson Street 750.